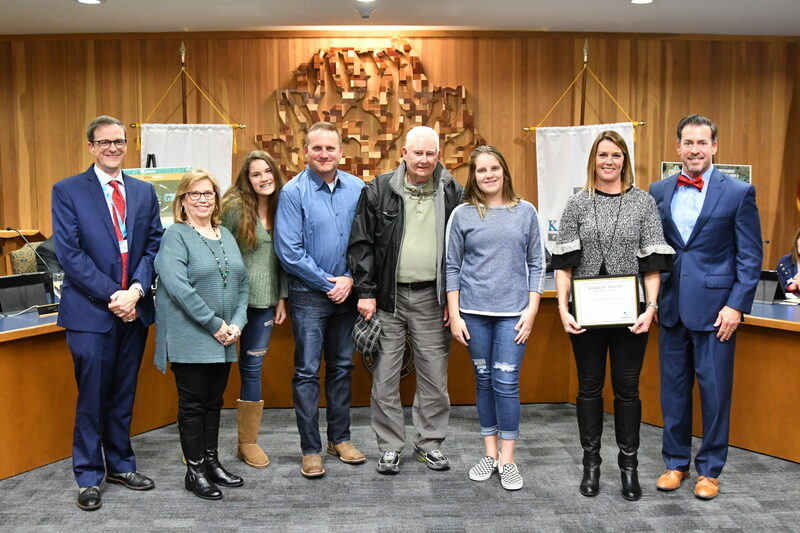 Lori Cook, Klein Collins High School’s Crisis Intervention Counselor, was honored as the November Alumni of the Month by the Klein ISD Board of Trustees during their meeting recent meeting. “She is one of the most outstanding educators I’ve ever known for caring for the whole student and serving students who are in crisis,” Deputy Superintendent Dr. Jenny McGown said. Cook’s first experience in Klein ISD was as a fifth-grader at Benfer Elementary, where she was awarded the #1 Bobcat Award her first year. “It was very special to me because they had never given that to a student who had only been there for a year. It meant a lot to me to receive that award,” Cook, who tells us the award is now proudly displayed in her garage, said. Cook later attended Strack Intermediate and Klein High School, where she played volleyball, ran track, and was a cheerleader for both schools. After graduating from Klein High School, Lori attended Southwest Texas State University (now Texas State University) where she obtained a BA degree in Psychology. While taking a social work class, she visited a residential home for abused children. That’s where she decided to help children who cannot help themselves. Lori’s professional career began at Child Protective Services, where she investigated abuse cases. A case at a local high school led her to apply to be a caseworker at the campus. She remained at that campus for seven years before moving on to Klein Collins High School, where she currently serves students as a Crisis Intervention Counselor.